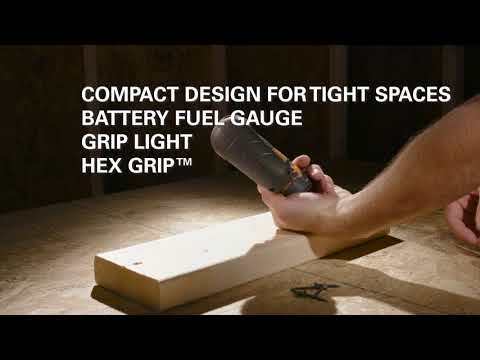 RIDGID introduces its new 12-Volt Palm Impact Screwdriver. This tool is first to market with an all new Push-to-Drive feature. This feature allows for pressure sensitive variable speed control without the use of a trigger. This tool is perfect for any contractor wanting to get into hard to reach locations. Includes Palm Impact Screwdriver, 1.5Ah battery, Charger, Philips bit, and Operator’s manual. 12V Palm Impact Screwdriver is rated 5.0 out of 5 by 2. Rated 5 out of 5 by oldguy65 from Caught my eye when I was looking around the "man toy" area of Home Depot. I bought this tool yesterday. Used it for the first time today to put drawer glides in a cabinet. I was surprised at its power as it went into impact mode when the screws were almost home. I am impressed with the work light, the battery power indicator, and the ease of use. So far, I would recommend this tool when you need to get into areas not easily accessible even with a small 12v driver. I look forward to playing with it a lot!! can this be used to bore holes with a 1 inch spade bit? Is there a viable replacement battery? Is there a replacement battery that will work without messing up the drill for the palm impact driver?